You are here: Home / News / Another great customer event at RSNA! 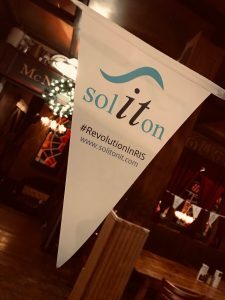 Soliton IT was delighted to hold their third RSNA Customer Party on Sunday evening for over 50 radiology and clinical imaging contacts. Hosted by Fados Irish Bar, the party attracted Trust and hospital radiology staff from UK and Australia, as well as sector Imaging Partners. For the first time, Soliton IT provided live entertainment exclusively for their guests; Finger on the Trigger, “Chicago’s Favorite Irish Band”, gave an amazing performance with the expected “engagement” from guests. Many thanks to all for their participation and we look forward to seeing you again, same time, same place, in 2019.